I'm a Modern Languages teacher who changed to Primary after 14 years of Secondary teaching. Read about my creative ideas for language teaching, suitable for more than just primary. Last week I spent two after-school sessions doing some training at a local primary school. They are just starting out with French, and so I began by teaching them the first lesson of the Sunderland scheme of work, which many will recognise as the "Deux petits oiseaux" lesson. One of my activities to practise bonjour, je m'appelle and au revoir was the dinner party one, where everyone has a character and has to go around greeting each other and introducing themselves until they find their partner. For example, Minnie Mouse has to find Mickey Mouse. I used the set of character cards that I use when doing the same activity with children. The deputy head of the school was sitting next to me while I was explaining the activity, and was having a crafty look at the cards. She whispered "I don't know who Boots is, or Miss Hoolie!" I think I assume that every teacher has to endure the same number of hours of children's television as I do. Dora the Explorer, Peppa Pig and the Disney Princesses are very well known in my house. Yesterday, children's TV came up trumps. My artistic elder daughter's Saturday lunchtime routine consists of coming back from ballet and having some lunch while watching Art Attack and Fingertips on CITV. Yesterday on Art Attack there was one particularly good item, which gave me another idea for Calligrams. I wasn't brave enough to make my own pencil outline, so I found this character on the Staedtler website. (I thought he was very suitable for the World Cup !) I pasted the picture into PaintShop Pro and adjusted the lines from black to pale grey. Then I printed out the picture and set about filling in each section with words. I am quite pleased with the overall effect. It made me think carefully about the words I was using to fill in each section, and the repetitive writing really drives the spelling home ! When I do another one I'll try shading each section in coloured pencil and then writing the words over the top in felt-tip. This will be a good idea to use for the World Cup. 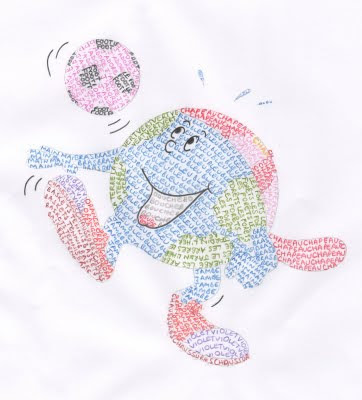 Once pupils have researched one of the countries playing in South Africa, give them a football player outline and they can fill each section with words pertaining to that country, in relevant colours. 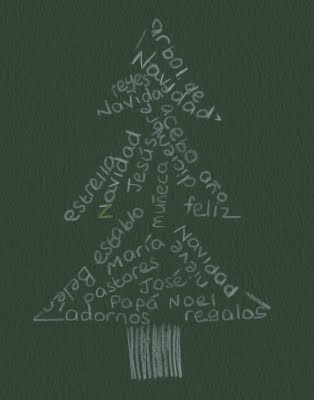 I have used the stencil method to create some Christmas calligrams with Y3, Y4 and Y6. We started the lesson with the Level 1 skill of copying single words accurately, to collect from the board a bank of Christmas words to use in the calligrams. This also enabled us to talk about Christmas in Spain. I got the stencils from here. We have found that the less blank space you leave in the stencil, the more effective the overall result is, and that colour really brings them alive. Click here to see Y6's Calligrams. I will upload Y3's and Y4's when they are finished - they are looking even better then Y6's. The lesson was very successful and the pupils obviously really enjoyed it. Their class teachers commented on how focussed they were creating their calligrams. Thank you for sharing this with us Clare. I has given me lots of ideas to use with my classes. Will certainly be using it with Year 7- You are an inspiration!! Thank you! It's a great way to learn vocabulary and have fun! MFL teacher and consultant in the north-east of England. Director of Ideas Education Ltd, webmistress of Light Bulb Languages. Visit Clare's profile on Pinterest.